Everyone in test industry have doubt, is manual testing dying? Will automation take over in future? Should we use manual testing or automation to test product properly? Both have their own advantages and disadvantages. 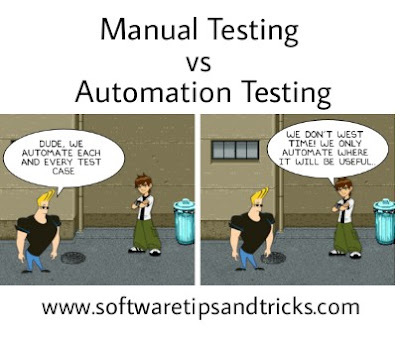 Let’s discuss “Manual Testing vs Automation testing”. Manual Testing – In this testing, test cases are executed by test engineers. They manually test product by checking all possible test cases. Automation Testing – In Automation testing, All the test cases tested by automated scripts. So based on given data, all test cases executed by computers one by one. Reliable – Automation test cases runs based on scripts. Whatever test cases written in scripts or tool, they never miss. Here the cost of test depends on cost of test engineers. Here the cost of test depends on the cost of automation tool. Time – Automation tools are very fast. They execute test cases one by one without stop. Humans don’t like to test same test cases repetitively. Automation tool can run same test case as many time as you want. Automation tools can do API testing faster and correctly. Automation tools can do all these things faster and correctly. Test Engineers have their experience. So, from their experience sometimes they identify some corner bugs. Automation testing done as per scripts written. They test with same flow every time. Humans can test from customer and end user perspective. So, they can observe if some scenarios are not user friendly or if some colour combinations looks ugly. Reporting of test cases depends human to human. Automation can do nice reporting with what all steps they executed and what all steps fail at what method. Manual testing and automation testing both have their own advantages and disadvantages. Based on product and features one need to decide how to test the product. Sometime combine effort is better. For new features, UI verification, Ad-hoc testing, exploratory testing Manual Testing is better. For Regression testing, Performance testing , Load testing automation is better.